Pole Top Rescue Training is part of our annual required safety training that all of our linemen complete every year. 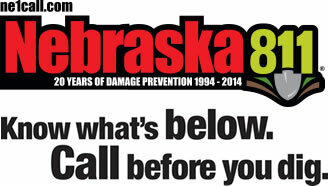 Crews are trained on how to save a fellow lineman should the need arise. Here’s the scenario: A line man is working and becomes unconscious while up on the pole (due to an electrical jolt, health issues, etc.). Other crew members on site have moments to call for help, race up to the top of the pole and lower the injured person to the ground. One by one all of our crews practice strapping on their climbing gear, climb a 35 foot pole and safely rescue a life size dummy weighing approximately 185 lbs. The dummy must be secured with a rope before being safely lowered to the ground. In an actual emergency, coworkers would then perform basic first aid and CPR until first responders arrive. 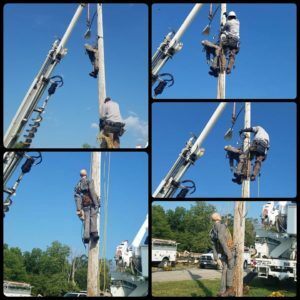 Pole Top Rescue along with other Safety training courses ensure our linemen work in the safest manner possible and are equipped, trained and confident in their skills and equipment.